Debut novelist Andrew Ervin’s clear, muscular voice never misses a step in Extraordinary Renditions (Coffee House Press) three connected stories that converge skillfully into a novel. Ervin tackles all the big issues in Extraordinary Renditions: life and death, war and peace, music and silence in a contemporary Budapest that is down-at-the-heels and clearly loved for its tawdriness by the author. “What amazed me the most about Hungary is that history is not history there,” he said recently in an interview. “The events of the past are still present every single day, at every minute, in ways I couldn't even imagine at first.” Extraordinary Renditions teems with this life and light. The lives of three very different expatriates come together on Independence Day, entwining their lives in ways they don’t really see and can never understand. A solider, an aspiring musician and a composer and Holocaust survivor struggle for their own independence and the freedom, in a sense, to breath deeply. There is a lyrical muscularity in Ervin’s writing that, at times, leaves the reader breathless. 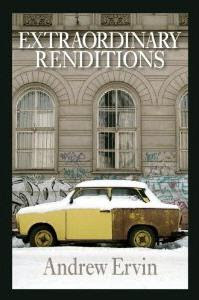 Extraordinary Renditions is tightly plotted and brilliantly composed. A very good book and, one hopes, a taste of things to come.